Yep… it’s our old friend Dewi Perssik, Indonesian dangdut singer and wannabee actress donning the “Fins & Tail”still trying her darnedest to be Indonesia’s Top “Scream Queen” and horror movie star. Persistent lil’ lady isn’t she? 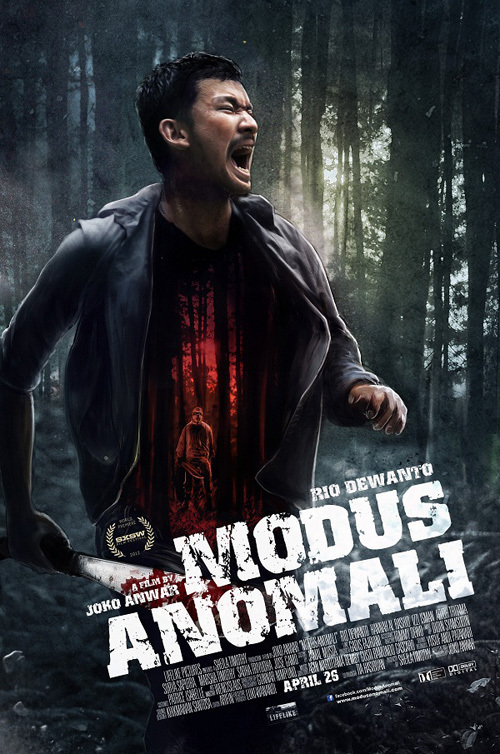 Here’s hoping she’s managed to elevate this one above the usual “craptastic” standards that most low budget Indonesian horror seems to revel in. But… hey… Your Favorite Catgirl Princess isn’t holding her breath with anticipation, Hehehe!!! February is here at last and with it the first featured Review of this month’s “Martial Arts Mayhem: Fighting Femmes Festival – 2016”. First up? 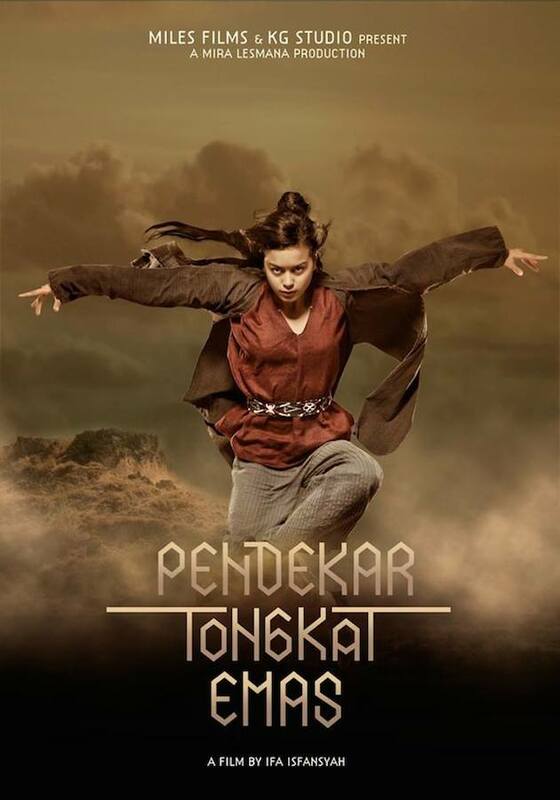 Well how about some “old school” Shaw Brothers style period piece Martial Arts storytelling by way of Indonesia with a look at 2014″s “Pendekar Tongkat Emas” aka “The Golden Cane Warrior”? Let’s see… we’ve got a nifty mystical weapon… a devastatingly deadly unstoppable “secret technique”… the classic old “aging Master passing the torch to his most worthy successor” plot idea… along with some good old fashioned jealous skulduggery by the stereotypical evil disciples trying to steal away the glory from the worthy one and give us the excuse for some serious “chop-socky” action. Yep, certainly sounds like all the classic old bits are in place. So… are you ready for some no-holds-barred hand-to-hand in your face Martial Arts action? 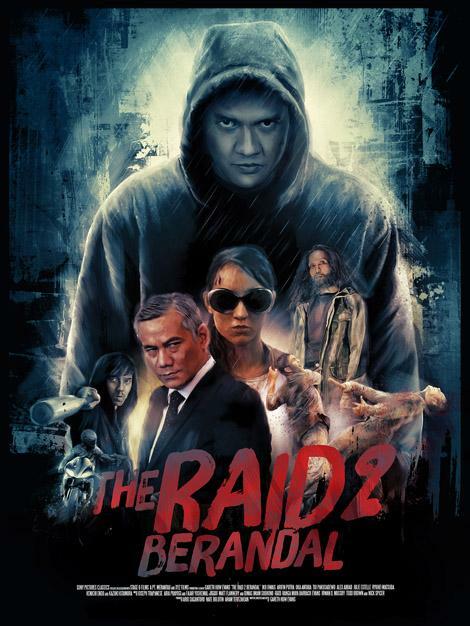 This wee Catgirl most certainly is, and luckily for me Indonesia is ready to answer my needs with “The Raid 2: Berandal”, the sequel to the surprisingly brutal and well-made original film by director Gareth Evans and again starring the absolutely amazing Iko Uwais in the role of young undercover policeman Rama. More bone-crunching pain… more wild and crazy fight scenes… oodles and oodles of brutal martial art mayhem… yep this lady is ready…. Are you? Time for another creepy movie Review from your Favorite horror obsessed Catgirl… this time a look at the recently released Indonesian psychological suspense thriller by director Upi Avianto , “Belenggu” aka “Shackled”. Killer ghostly potatoes? Nope it’s not a joke, but is in fact a very real movie.With a silly basic idea like this, you just know your Favorite Catgirl’s gotta quench her obsessive need to see it…. and you, o’ lucky Gentle Visitors can let me tell you all about it so that you won’t necessarily have to. Sounds like a winning idea to me… So watch ya waiting for? Grab your crucifix, your Holy Water, a sharp mystic potato peeler, and some sour cream & chives and let’s get on with it, shall we? Goofy scares await!! So watcha waitin’ for Gentle Visitors? Let’s “Read On” and find out all about this one…!! Now I’ve been itching to see this one for quite some time now, but my hope to catch the original Indonesian release has been frustrating. I’m not even certain that it’s been released there yet, but it’s certainly gone global with both US and Hong Kong versions popping up this week alone. Waaaaaahhhh!!! But…but…. I just can’t wait! So, I snagged the unrated version of the US Region 1 for me, Carolyn, and Sam to do a proper Martial Art Action “movie nite” this weekend. Wanna hear all about it? Then let’s just get down to business and “Read On”.…. Yay!! My perseverance has scored me another few of those wacky Indonesian horror films that your Favorite Catgirl just seems to thrive on like salty snack foods…. soooo darn bad for you, but sooo darn tasty too!! Are they good movies? Ummmm… not all the time, but they are usually pretty fun lil’ bits of movie silliness… and that’s what counts. So…. take a big bunch of pretty Indonesian girls in bikinis… throw in a few hunky guys…. a little potty humor… and one goofy rubber sea monster and I’ll be darned if you haven’t got yourself a movie! Am I expecting a classic? Nawwwww… But, at least my sweetie says she game for all the pretty Asian girls in bikinis that want to cavort their way through a film for our entertainment… 😉 (Such a brazen tease!! I’ll be certain to get even with her later!!) 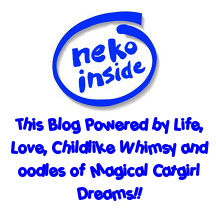 As always, to catch a bit of the action yourself, you just have to “Read On” and let Neko tell you all about it! Time for another review and so it’s off to Indonesia for some haunted high school hi-jinx in the Indonesian horror/ comedy “Toilet 105”….. Toilet!? Yes, you read it correctly… your favorite Catgirl actually managed to find herself a movie about a haunted toilet. Gotta admit… we don’t see many of those in this part of the world…. Must be an Asian thing. Hehehehe!! Synopsis? Yep, I’ve got one… and it goes sorta like this: “Three friends, Okta (Ricky Harun), Ical (Lionil Tikoalu) and Rio (Rizky Putra), who are all students of SMU Bina Persada become infatuated with pretty Marsya (Coralie), a new transfer student to their school from France. Unfortunately, Okta already has a girlfriend, Viola (Navi Rizky) who is jealous of the attention he shows towards Marsya. Along with her fellow cheerleader friends, Viola also likes to bully new students.They soon turn their attentions towards poor Marsya. Mrs. Endang (Suti Karno), the principal of the school repeatedly reminds the students to accept Marsya as one of the students, assisted by her husband, Mr Wahyu (Indra Birowo), who is a counseling teacher. But trouble always seems to happen anyway. I’ve had this one for a while now, but somehow it managed to hide itself away in my big ol’ backlog of DVD’s waiting to get watched. It managed to surface just in time for me to get a giggle remembering just how goofy it sounded when I bought it. Could I pass it up again? Nawwww…. I’m just that sort of silly lady. Plus… I couldn’t wait to see the look on Carolyn’s face when I sprung this one on her…..
November has slipped by and December is finally here, but I’m still squeezing in the odd movie review here and there in this busy Holiday season. This time out, another Indonesian horror effort, “Taring” by director Rizal Mantovani of “Kuntilanak” fame. So, have I got a synopsis? Yep… and it goes sorta like this: “Farah (Fahrani Empel) is a lingerie model and is working for an agency called Heaven’s Secret. One day she receives a work offer with the theme “Wild Fantasy” for photo session in Werenggini, a forest that is located in near a remote village. She gladly receives the offer as she desperately needs the money for medical treatment for her sick mother. Together she heads to the forest with two friends and fellow models; Wiwid (Shinta Bachir) and Gabriella (Rebecca Reidjman) for the photo session. Following them are Alex (Meidian Maladi), the reprensentative from the agency, together with photographer, Iyan (Dallas Pratama) and his sister Inngrid (Reynavenska). Upon their arrival at the entrance of Werenggini Forest, the local residents advise them not to enter as the mythical “forest keepers”, who are evil by nature, are seeking sacrifices in human lives. However, the stubborn Alex insists on proceeding with the photo session inside the dark forest despite the warnings. Oooohh!! Forest Demons!! Neko’s all over this one! Hopefully Rizal will score well for me this time out, although he’s gonna have to work at it pretty hard to equal the creepy enjoyment “Kuntilanak” brought this lil’ Catgirl. So break out the wine coolers and settle in and your Favorite Catgirl Movie Princess is gonna tell you all the gory details! !